Having a number of spare skirts handy in your tacklebox can save you a trip to the tackle store, and may even help you avoid headaches on the water. Skirts on your favorite spinnerbait, buzzbait, or jig wear out eventually. Replacing the skirt when they fall apart is cheaper than buying a new jig or spinnerbait. I've also been in situations where I'm running low on a particular jig or spinnerbait color and that's what the fish want. 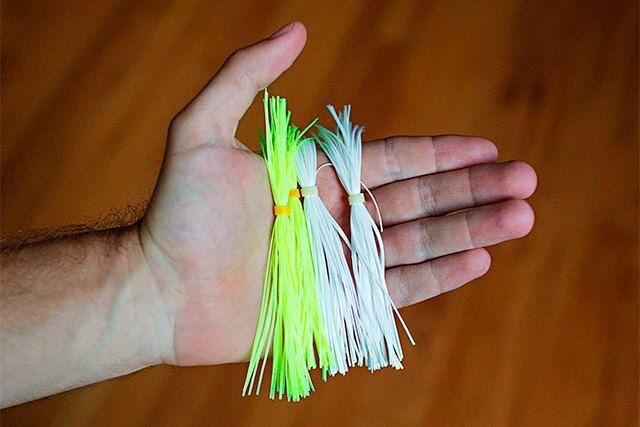 In the event that you run out of black and blue jigs on the water and that bite is hot, having some black and blue skirts on hand will allow you to keep fishing that color of jig when you do run out. I try to keep spare skirts in the colors I fish most commonly. Finally, buying spare skirts in a variety of colors will also allow you to try that color if you don't want to commit to buying a handful of spinnerbaits or jigs. Simply swap out the skirt with the new color you'd like to try and you're good to go.